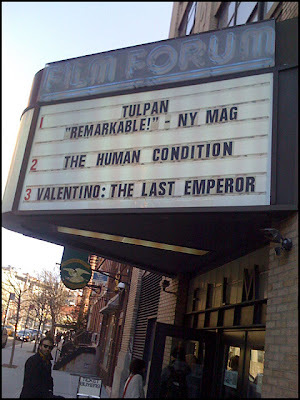 Went to Film Forum to see the new documentary Valentino: The Last Emperor. Excellent production values, seamless editing, strong cinematography, remarkable access. Very polished and entertaining. After some reflection, my only complaint: there are no surprises. Everything is as it seems, and there's no particular transformation or moment where a challenge is overcome. Still: the film is at least a match for the other four or five fashion docs that have come out in the last few years, and avoids the pitfalls so common to the genre. The filmmakers seem to realize that at a certain point, heroicizing a fashion designer becomes a little silly -- and they walk it right up to the limit, but no further.